I finally built something I have been wanting for a while - an easy way to switch antennas and radio. I wanted something more flexible than the basic N position switch, which is great if you want to switch several antennas on one radio (or one antenna between several radios). But how to switch multiple antennas and radio? I considered (but quickly shelved) something using a matrix of switches or relays. It would be complicated, quickly get expensive, and not provide much isolation between antennas/radios. The first row is for the radios, the second for the antennas. Short (1.5 ft) BNC cables connect a radio to an antenna. I can easily switch which antenna is connected to a particular radio, as well as quickly unplug all of the antennas if a storm approaches. I decided to use non conductive wood in place of metal, as I wanted to maintain the electrical separation of the various cables. I suspect metal could be used as well, if it was well grounded. Actually, I think it is better to keep every run electrically isolated. 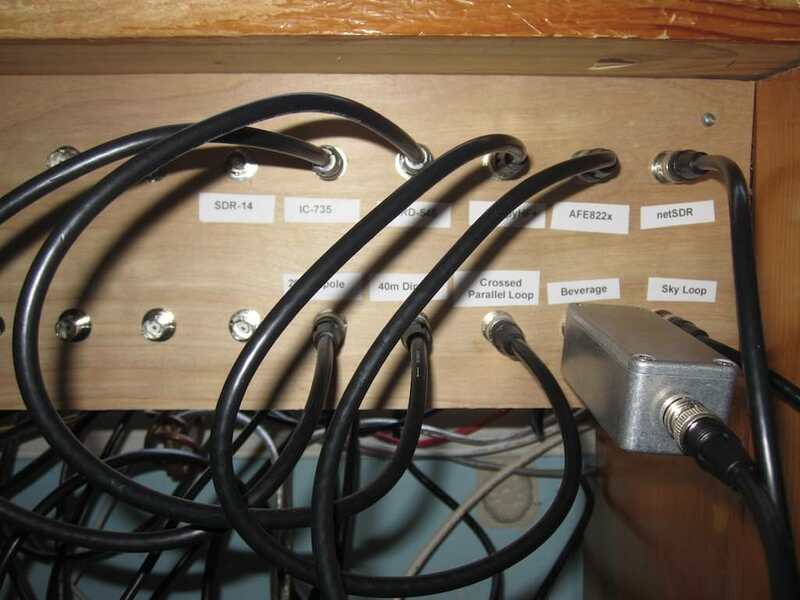 The metal box you see plugged into the beverage antenna connector is a homebrew low pass filter for longwave. I have several unused BNC jacks, for future expansion. An economical alternative to a jumble of switches, etc. 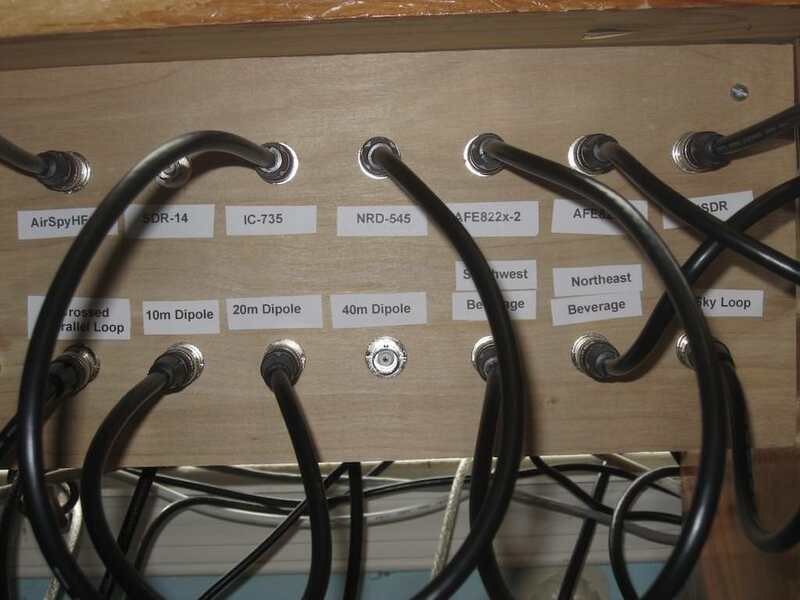 Some updates to the patch panel, to reflect the addition of the 10m dipole and second beverage. I also added a connection to the second RF input on the AFE822x SDR, for phasing, and re-organized some of the locations, for ease of use. In hindsight, I would space the jacks a little further apart, although the current setup works, it can be a bit tight. I contemplate a grounded aluminium board with multiple bnc (or perhaps f fittings) bulkhead fittings, and several cable tv splitters (one splitter feeding two to get the same signals to at most four receivers as inexpensively as possible) mounted on the backside to feed various sources to various receivers. Originally I was going to go with F connectors, but they're a pain to screw into the jacks. There's push on F connectors, but I am not sure how well they'd work. I purposely avoided a metal board, to keep the grounds at the patch panel separate. I do have a splitter I made for HF, I was contemplating installing it on the end of the patch panel. Right now it is in a small metal box, the same size as the LW low pass filter, it actually works OK that way as well, hanging in the air. An inexpensive hardware store variety TV splitter will have about 3.5 db of loss per split. Therefore, to split a signal once then each again to feed 4 receivers would mean there would be 7 db loss at each receiver. This may be OK for a cable TV or a strong OTA application but not suitable for weak signal work. 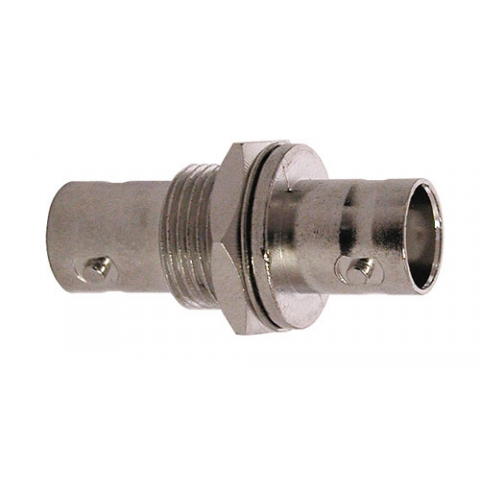 Quality BNC and F connectors are each typically rated for 500 operations. The key word is "quality". Otherwise RG-6 is as good or better than most types of commonly used Ham radio coax as far as loss specs are concerned and a lot less expensive. The F connector is easily installed with no soldering required. Generally, CATV hardware (splitters, amps) provides little use below its cutoff frequency of around 40 MHz. I would have used a 2U metal rack panel with D cutouts, and used insulated jacks. For DC protection against lightning, small shorting switches can be placed across the lines coming in. Good points there, the feeble center conductor in a typical f con rules it out for me. A friend made a panel looking very similar to yours, but with slip on uhf cons, works fine. Some of them go down to the ambc band without too terrible loss, most are rated to 5MHz at least anymore they are. I have a handful so will do some testing to see what's what.